Have you ever sat back and thought to yourself what exactly am I doing here? What is the purpose of my life? I’ve struggled with these thoughts over the years. At times I feel like I’m living for myself and not doing anything great or significant. According to the official Kwanzaa website, Nia (meaning “purpose”) is described as making our collective vocation the building and developing of our community in order to restore our people to their traditional greatness. I agree that we must all play a role in restoring our people to their rightful place of greatness. My conflict though is, how can I play that role for my community when I struggle to do it within myself? At times my life feels like a mess. I’m that notoriously single friend. I can be a bit socially awkward and often times find myself alone. I haven’t achieved the pinnacle of my career goals. So just what is my purpose here? It’s so easy to focus on the things going wrong in life, but something within me makes me feel that my life is beyond me. With this in mind, it is my responsibility to look beyond what’s wrong in my life and focus on what assets I possess. I can use the struggles I have been through to help motivate, empower and give hope to those who have been through the same experiences as me. One of the highlights of my life right now is serving as a mentor for the girls at the school where I teach. We meet every week to discuss such topics as hygiene, self esteem/self love, etiquette, entrepreneurship, health and other topics. As I look into these faces of the future each day, it gives me a sense of purpose knowing that I’m able to mold their lives using my experiences to hopefully steer them in the right direction. Working with them helps me to quickly dismiss the negative thoughts that try to rear their ugly head about why exactly I’m here. I’m here to fulfill just what the meaning of Nia stands for. When the world seeks to tear down these girls who are our future leaders, it is my responsibility to cancel those attempts at every side. We will all go through our fair share of trials. Our lives will appear to be a mess at times, but we can’t stay in that place. We must collectively take responsibility to pull ourselves out of that place, and then pull up our brothers and sisters to help them see the beauty inside of them. Every time I bake a dump cake I think about this process. You literally dump all of the ingredients into a pan. They appear to be a mess and when you first make it, you might wonder just what is so special about this mess of ingredients. After they are put through the fire, something amazing starts to take place. Those ingredients bake and mesh together to transform from a mess into one of the most beautiful and delicious treats you’ve ever had. Recipe originally published on Brandi’s Diary food blog here. Spread 2 cans of peach pie filling around a 9 x 13 inch pan. Sprinkle apple pie seasoning and pumpkin pie seasoning directly onto the peach pie filling. Mix until all of the seasoning is thoroughly mixed into the filling. Dump the box of spice cake mix over the top of the filling. DO NOT mix the cake mix into the filling. Make sure that the cake mix is evenly covering the peach pie filling. Thinly slice one and a half sticks of butter and place slices on top of the cake mix side by side with a little space in between. Reserve the other half of the butter for later. Place dump cake into the center of the over and bake for 40 minutes. Check the dump cake and use the additional half stick of butter to fill in any areas of the cake that still look dry. Place back in the oven and bake for an additional 20 minutes or until golden brown. Brandi Barnett is a full time teacher and part time blogger in Dallas, Texas. When she’s not motivating the minds of the youth in her classroom, she is spending her time traveling, volunteering, spending time with family and friends and sharing the special moments with her audience along the way. 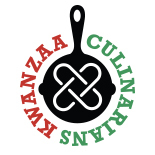 This entry was posted on December 30, 2017 by Kwanzaa Culinarians in 2017, desserts, Nia, Personal Story, Recipe and tagged cake, dessert, fruit, peaches.